Hello! My daughter Rebecca and I are excited to introduce a new series on our blog called Beautiful Feet Books Fundamentals. We will be answering questions like “Why teach history?” and “Is Beautiful Feet Books classical?” and “What’s the point of using literature to teach history when textbooks make it so easy?” We hope you find these posts useful. We’d love to hear from you so feel free to email us with questions or comments at: rebecca@bfbooks.com or rea@bfbooks.com. Also consider sharing your experiences in the comments section here on this blog. Let’s get a conversation going! Without further ado, here we go! The fact that this question is now a common one points to an increasingly utilitarian view of education. In many ways the answer to the question of why to teach history comes down to one’s educational philosophy. Is the purpose of education simply preparation for entering the workforce or is it something more? If you believe, as we do, that education goes beyond employee training, then like us, you probably believe in the importance of rich historical study. If you have a philosophy of education that includes training in critical thinking skills, reason, citizenship, and the formation of character, you probably have a great respect for the study of history. Unfortunately that educational philosophy, while ascribed to by many, is rarely held in conviction by educators and certainly not reflected in government mandates. Current statistics on student’s knowledge of the basic facts of US history reveal a disturbing ignorance which belies any devotion to the study of history. Education is viewed as valuable in so far as it prepares young people to be good employees. And yes, education should prepare young people for adult lives, of which work is an important and valuable part, but it has a much deeper value in training young people to be compassionate, thoughtful, and engaged members of their communities. Over the past century, the study of history has been increasingly isolated from the other disciplines. Beginning in the 19th century textbooks became the primary mode of teaching history. The drive towards standardization within classrooms drove the development of the textbook and it proved useful for subjects like math and science. Unfortunately for teaching a subject as vibrant as history, the adoption of textbooks stripped the subject of all its life. Where history was once the study of our human story and was filled with tales of adventure, heroic quests, stupefying failures, humorous dunces, and wicked villains, it became a collection of names and dates to be chanted over and over until they were firmly fixed in young minds. 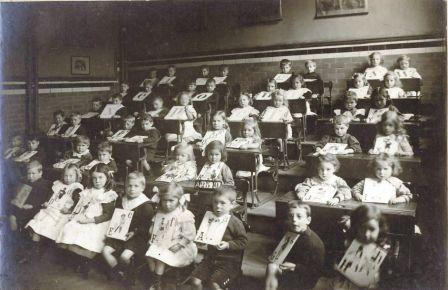 One can picture the one-room school houses with their strict schoolmarm, pointer in hand, drilling facts into the heads of students as they chant away the names of the presidents, dates of various battles, etc. Now, this approach, still employed by some educational approaches, is a great way to instill a knowledge of facts, but it’s not so great for teaching students to engage with history, to form informed opinions, to discuss ideas. From the beginning of time, we human beings have been storytellers. Long before people thought up the idea of “history” we were telling one another stories from the past, connecting our short lives with a long chain of others who came before us. Whether it was relating creation narratives or listing genealogies, whether it took place around a tribal circle or in the marble forums of ancient Greece, these stories were our first “histories”. Often thought of as myths now, they provided ancient peoples with a context for the human story. Part of the human condition is the ability to question our place in this world and history provides part of the answer. In relating the human story and connecting ourselves with the vast pageant of people who came before us, we get to know ourselves a little better. We can see our lives within the context of something greater than ourselves. 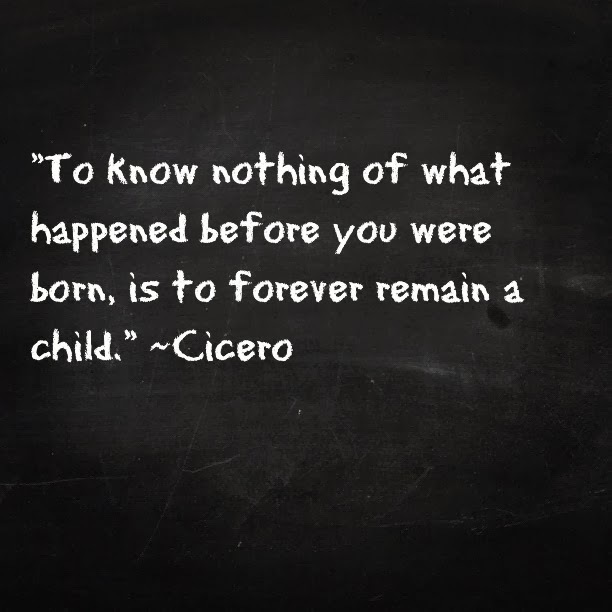 And history provides invaluable lessons in how to conduct ourselves. We can learn from the fascinating successes and failures of people who are not so different from us, but who lived in the centuries before us. 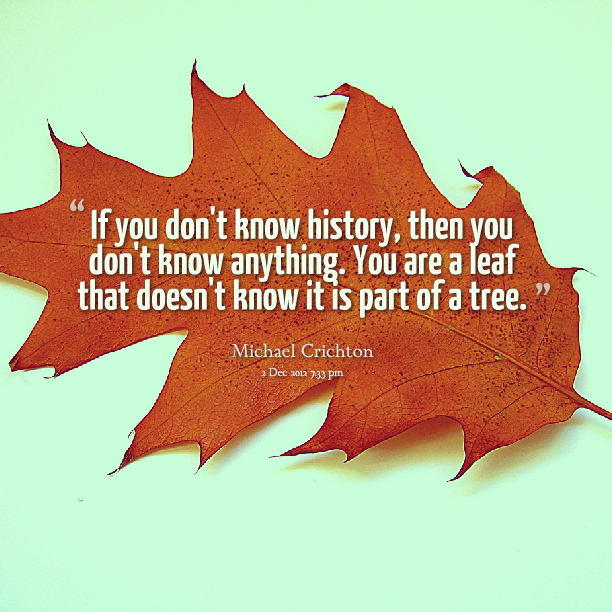 This is the greater purpose of history–and it is lost when distilled down to basic names, dates, and “facts”. But what about getting a job? advocating that we start teaching computer coding and advanced math in elementary school. This could be very short sighted. It is no longer a world where one can choose a career path and expect to work within that chosen field for the entirety of one’s career. The average young person will change jobs/careers fifteen times in his or her lifetime. That’s probably 12 times more than his parents and could be 14 times more than his grandparents. In a job market that is so fluid, the skills required are not necessarily highly specialized. Yes, it’s a good idea to know how to write computer code, but it’s more valuable to be able to think critically, to be creative and innovative, to understand human nature, make rational arguments, be an engaged reader, a thoughtful writer, and a thorough researcher. The study of history taught holistically provides these skills. And so you may find yourself asking, how do I teach history “properly”? That question will be answered in our next entry in this series. In the mean time, leave a comment below telling us about your experiences in learning and teaching history. Don’t forget to sign up for the Great Homeschool Convention coming to Ontario, California this June. There is a great line-up of speakers that you won’t want to miss! Also stay tuned for the session topics Rea will be speaking on there! If you sign up through the Beautiful Feet Books link (above) your registration will earn a donation to the Patty Pollatos Fund to support Brent Blickenstaff! Thank you! I am very much looking forward to this series you’re planning. I’ve forwarded the first post to many 🙂 History is our favorite subject and living books are so important! Do you ever have plans of speaking anywhere in the MIdwest? Or do you have online seminars? I’d love to meet you or hear you speak. Hi Melissa. Thank you so much for your comment. We are currently working to train a rep for the Midwest which means we will likely be there sometime in the future! If I have a speaking engagement there I will post it here on my blog, so stay tuned! That sounds wonderful! I’ve linked your blog to mine and I look forward to future posts.